I get this a lot. People constantly keep asking me this question. And why not? One must be curious about the potential monetary benefits one can have. Well, there's no simple answer to this. A freelancer can work for free or make millions depending on the type of work he is involved in. I know people who make as much as they would do in a regular 9 to 5 job. I also know freelancers who make at least ₹20L a month, which is only the lower limit for them. If you are willing to put in all the necessary hard work, you can make enough to buy a mansion on Sunset Boulevard. Having said that, how much can be made through freelancing is a topic of discussion for later. We will discuss this in detail. All you need to know right now is that you can easily make more money than your employed counterpart. What kind of jobs does freelancing offer? Freelancing is not a single entity where you apply for suitable jobs and start working. No, absolutely not! Freelancing is a system which enables people to work on their own, make their own careers without being employed in one particular company. The name(Freelancing) itself suggests that you are free to choose the type of work you want to do. Any job that you can do as an employed professional, can be done as a freelancer. You think of a particular job, and people are already freelancing in it. The most common freelancers you might have come across are house-maids, handymen, gardeners or sometimes even electricians. These people don't usually have a particular employer. They work on their own and find their own clients. However, in today's digital world, freelancing has been extended to almost all kinds of white collar jobs. It has now become easier to find clients online and communicate with them sitting at home. You deliver the goods via Internet and receive payment the same way. Almost any job can be done online. All you need is a computer and an Internet connection. Saves time and money; and gets rid of the hassles that come with traveling. You can work in your pajamas or wear nothing at all. There's nobody to ask. You negotiate your own price for the job. There is no fixed salary. Sky is the limit on how much you can make. No office politics. You can concentrate on your job. Your work will be rated on merit. Not by how your boss sees you. Freelancing is not everyone's cup of tea. 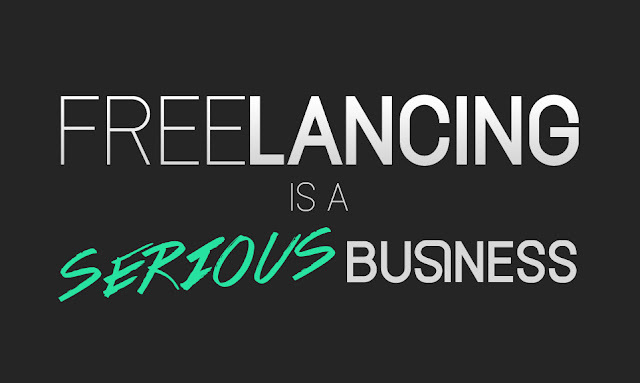 It requires determination and patience of the highest order to become successful in Freelancing. Those who keep working make it big while others don't. To answer the question, you must have minimum skills to start freelancing. One cannot just wake up one fine day and shout, 'It's a beautiful day today, let me start freelancing!'. Sure, you can start Freelancing with basic skills but it will often prolong your process of finding clients. You either start a pro or keep working constantly to become a pro. In the next blog post, we will talk about how to start freelancing and other things. To get constant updates regarding freelancing, business and other related topics, subscribe to the blog.